The inaugural Travel Nurses Day will be Friday, October 11, 2013. Festivities will span the week leading up to the holiday. 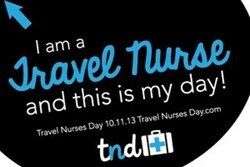 Travel Nurses Day will be Friday, October 11, 2013, preceded by a week of games and contests at TravelNursesDay.com. We really enjoy celebrating Nurses Week with our Travelers each year, which got us to thinking that there should be a day geared specifically to honoring travel nurses. It’s really been fun creating this new holiday and gearing up to celebrate it. Medical Solutions announced today that it is kicking off festivities for the week leading up to the first annual Travel Nurses Day, which will take place Friday, October 11, 2013. The pet friendly travel nurse staffing company launched the holiday in an effort to celebrate travel nurses and thank them for their unique contributions to the healthcare field. Travelers began the celebration on October 4, 2013, when the games, contests, and prizes portion of TravelNursesDay.com went live. The website features Pictograms, a Photo Observation Game, Anagram Puzzles, and a raffle. Prizes include 15 $50 gift cards to Starbucks, Zappos, and Spa Finder, and a grand prize $250 Scrubadoo gift card. Winners will be announced on Travel Nurses Day, October 11, 2013. ABOUT MEDICAL SOLUTIONS: Medical Solutions L.L.C. became the nation’s third-largest travel nurse staffing company with its acquisition of OA Nurse Travel in 2013. Medical Solutions was one of the first Travel Nursing and Allied Healthcare staffing companies to be certified by the Joint Commission and has been continuously certified since 2004. Its focus is on meeting the urgent and short-term staffing needs of its clients with highly skilled Allied Health professionals, nurses and technologists. Medical Solutions was named one of the top three staffing firms to work for in Staffing Industry Analysts’ 2013 “Best Staffing Firms to Work For,” and has also been named six times to the Inc. 5000 list of fastest-growing private companies. A nationwide network of travelers allows Medical Solutions to help its client hospitals continue to provide excellent patient care amidst a Nursing and Allied Health shortage. Medical Solutions has contracts with nearly 1,200 client hospitals nationwide and is one of the fastest-growing companies in the Travel Nursing and Allied Health industry. Visit MedicalSolutions.com to learn more.